Product #18405 | SKU X10-LITE | 0.0 (no ratings yet) Thanks for your rating! 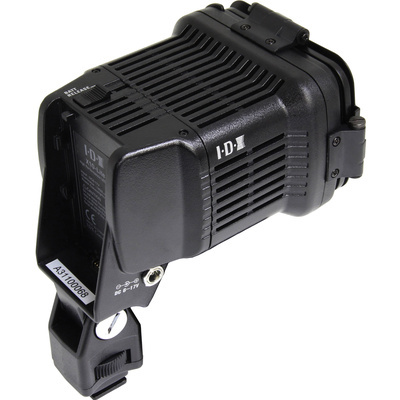 The IDX X10-Lite Hi-Performance LED On-Camera Light mounts to a standard accessory shoe on your camera, and provides a powerful beam that can be dimmed from 100 to 0% without affecting the beam quality. The LEDs in the unit are rated to last up to 50,000 hours, and the unit powers from available IDX SSL-JVC50 type batteries (not included). You can also power the unit from a 6 to 17 volt DC source using the included D-Tap connector. A sealed, scratch resistant lens protects the LEDs, and they deliver 1450 lux at 1m, with a 90° beam spread. This allows you to light a relatively large area from an on-camera light. For a tighter beam, you can flip up the bottom barndoor, which will adjust the beam spread to 45°, giving you more control, and less spill. The LEDs produce light with a color temperature of 4500K, which is roughly halfway between daylight and tungsten values. The barndoors incorporate a color correction filter that you can fold in front of the light to convert the color temperature from 4500K to 3200K.